YOU’RE NEVER TOO OLD FOR A MID-LIFE CRISIS. When Deena and Gary return from an anniversary trip to Italy, nothing seems the same. Gary is restless at his job while Deena just wishes she still had one. To make matters worse, one of Gary’s clients who owns a vineyard, has killed himself. However, the victim’s sister thinks he was murdered and her suspicions lead Deena and Gary to team up to unearth the truth. Can Deena impress the local newspaper editor enough to get back her old job? Will Gary quit his business to become a farmer? 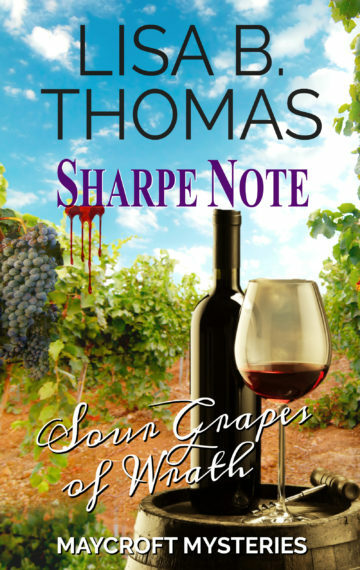 The stakes are high in Sharpe Note, book 7 in the Maycroft Mysteries. This clean mystery will have you guessing whodunit as you snoop for clues along with your favorite amateur sleuth, Deena Sharpe.